I borrowed this picture from a girl from our church - I didn't get an outside one. Doesn't it look inviting? 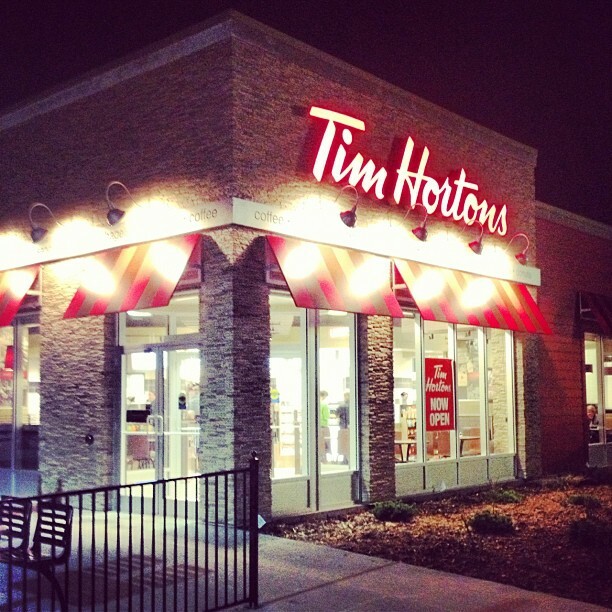 So friends of ours just opened their own Tim Hortons. We drove over to their Oakbank, MB location on opening day for a quick "hello" and of course some treats. My David is drinking my favourite Tim's drink - steeped tea double double! Our littles didn't have the capacity for a long visit at that time of day, but we said our congratulations, prayed a blessing for our friends and their business, took a few pictures and called it a day. Maybe my David and I can make it out there on a date night for a longer visit. Let me say this, it's beautiful! This location is a 24 hour spot with two drive through line-ups and it has a great fireplace surrounded by lounge chairs. I'm sure Oakbank is excited to have their own Tim Hortons, but I'm excited for my friends. I just know that this is going to be a great adventure for them full of amazing blessings. Scott and Andrea, we are so happy for you and wish you all the best! Oh Coralee!! You are the best friend a person could ask for! Thank you for your constant encouragement and smiles. You made me cry!! (I only NOW got a chance to read it!!) Thank you thank you thank you for all your and Davids support. We love you guys and cherish your friendship.